Combine the best stats of all the fighters on Nuts TV into one super-character, then use him to beat all comers in this Top-Trumps style game. Uh oh, it’s a button-basher. The default idea when no other game concept springs readily to mind. This one is a little more cerebral than most button bashers though. You have to hit the buttons, then relax back to repeat the exercises at hand. Plus, the characters are pretty amusingly a finger and a thumb. The premise being you have to train up your fingers before attempting to play the game on the DS. Use the mouse to dodge incoming missiles in this fast paced side scrolling action game. How long can you last? Behind this basic looking game lies a well tuned piece of gameplay. Anyone can pick this game up in seconds and it feels good to float about on a flying surfboard, but mastery is a tricky task. At it’s heart, there’s just one task – dodge missiles. And only two types of missile too – straight ones and seeking ones. Behind the scenes though there’s a subtle level progression that takes you through some 15 or so different stages of types of attacks. From one at a time, through waves of attacks, to an endless onslaught. You can really get into a rythem of dodging and it feels great when you get into that flow state, diving one way or another almost omnisciently. The game played awful for a while due to not being able to see/anticipate where the next missile was coming from before it was on top of you. The addition of arrows at the edges that grew as the missiles got closer helped a lot, then the final touch of a launch sound that subtly prompts the player to look out for a new arrow finalised the gameplay feel. The motion of the Surfer himself mattered a lot too. He needs to be flingable, but also controllable. To move fast when needed, but also to have precise control when required. This is achieved with a fairly complex system of accelerating towards the mouse faster the further away he is, and progressively more damping the closer to the mouse he gets so he doesn’t overshoot and oscillate wildly. The game looks like a sideways scroller, whizzing over trees at a tremendous rate. The background scroll is a simple looping tween however, and all the gameplay is static on top. Even when I tell myself this whilst playing, it’s a powerful enough illusion to give me a real sense of speed. One of the few issues I have with the game is that it only becomes really fun for the player when they are challenged to their skill level. When you’re learning to play, the game ramps up appropriately, but when you’ve played a few times already, you have to wade through the early easy levels to get to the fun bits. There wasn’t much scope for changing this in the project, but if I were to revisit this game I’d think up something to let you play on from where you were before. 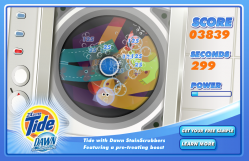 Use your mouse to control the main bubble and erase stains in this washing machine clean ’em up. Grab the bonusses for a powerful boost in cleaning power. The original concept for this game started out as a fun sounding idea. You were a bubble, inside a washing machine. You’d naturally cling to the edges, but could leap out into the spinning drum where you’d clean anything you passed over in your jump. The jump would be affected by the tides, centrifugal force and so on. After prototyping this, the client didn’t like it. It wasn’t a bad game, but it was pretty hard to pick up at first. We offered to make it easier (it was just a prototype after all), but they instead wanted a completely different gameplay mechanic. Their suggestion was close to what you now see. I built the new mechanic, and discovered it was dull! Boredom isn’t a good basis for a game, so I set it up to be pretty short on the theory that players might stand a chance of getting to the end. Also, the game has few special tricks (basically, slow mode, fast mode and bonus mode), so I spread these densely across three levels so that the player would constantly have something new happening, if only for a short period of time. It wasn’t an awful game at this point, but wasn’t great either. Most people who playtested it at least got to the end which was the point, as that’s where the datacapture and competition elements came into it at that time. The client liked this version more, but wanted the experience to last longer. Much longer. At their request, we extended the game to ten levels each as long as the previous, with a chance to drop out at any point if you failed to clean the super-stain or collect one of the boost bonusses. Now, not even the in-house quality testers would play to the end. For a couple of levels it was interesting, but after that it was just repetitive and dull. The client liked this version lots, and that’s what you see today! Don’t get too attached to your creation if you have any form of external client to answer to! It’s not advisable to stick too closely to the product’s concept in an advergame. Often it’s better to make a good game, and find a way to shoehorn the product into it rather than the other way round. I wrote this game as an experiment in advertising. It is deliberately a simple game, but with a few silly tricks that give it some lasting appeal so it’d distribute well. Then, I put a version on my site with google ads, a version out on the web with mochi ads built in and a version on Kongregate with their ad-share system in place. All of the above are over a period of a fair few months. So, number one problem: Not enough impressions! Number two problem: Mochiads pays bugger all! A hundred thousand impressions isn’t a lot, granted, but then neither is $16. Scale that up by a factor of 10 for a million-plays game (which is about right for a fair game with fair distribution), and you get $160. Which is pathetic. Google ads looks rather better, but remember that the ads don’t travel with the game, but stay on your own website. That means you only get paid if people are actually on your site itself, not if the game is played on a portal elsewhere, which is the norm. Get rich quick via advertising? Doesn’t seem likely from these figures. Use your mouse to drag the shapes into place. Rebuild the railway track, and Thomas the Tank Engine can take the children safely to the play area. This simple kids game was created in about a day for Drayton Manor. Take control of the reindeer with your left mouse button (hold to go up, release to go down) and try to collect the Hyperlaunch staff members whilst avoiding snow flakes. Get the ever longer chain of staff to the new offices! 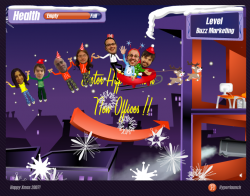 At Hyperlaunch it was the tradition to do an online xmas card for our clients each year. In 2007 this was the game I built for the occasion. It makes heavy use of my AS2 physics engine with the gravity set to left, rather than down, to make the chain of collected people string out behind the sleigh realistically (if cartoonishly). 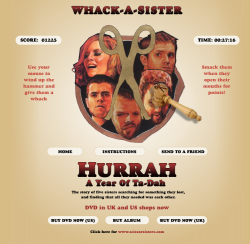 Use your mouse to wind back the mallet, then unleash it on a Scissor Sister when they light up and make a sound. 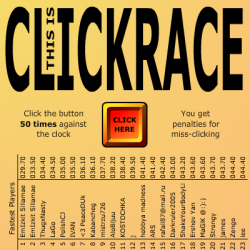 The harder you can hit, the more you’ll score in this whack-a-mole style game. Watch for the real-time ripple effect wherever you hit. It’s a bigger effect if you wind the mallet back further, and I haven’t seen this effect done elsewhere on the web yet. It’s produced by animating a displacement colour map filter over the clip that holds the Sisters. Use the cursor keys to dodge the incoming laser blasts from the aliens on your Dareway scooter. The Dareway itself is a cheap copy of the Segway scooter for children, only with none of the cleverness of the original. This microsite was to promote the toy, and the game was rushed together from the Silver Surfer games. It plays OK for a few minutes, but is never going to set the world alight with new concepts! Watch for the tell tale green glow of the laser lines approaching to anticipate where you’re being fired at from, and reposition yourself to avoid getting hit. Take too much damage and you’re out.